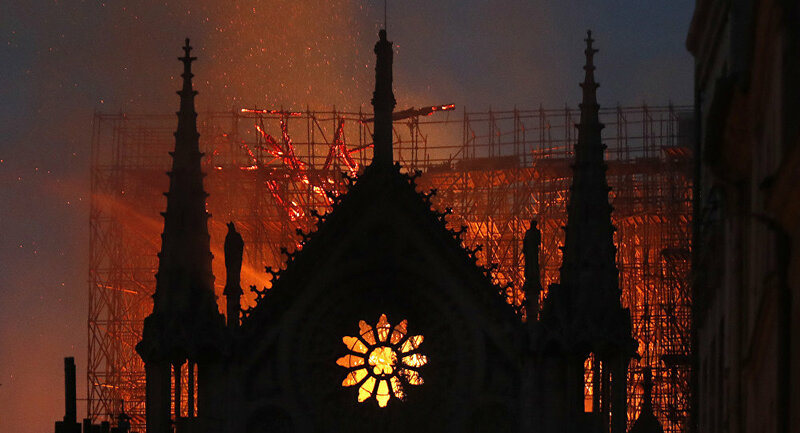 The iconic Parisian landmark suffered a devastating fire on Monday, with the blaze destroying two-thirds of the ancient cathedral's roof, its clock and its 300-foot spire. Hungarian Deputy Prime Minister Zsolt Semjen has called the fire which engulfed the Notre Dame Cathedral a "tragic symbol" of the "apocalyptic loss of values we are witnessing in the Western world," AP has reported, citing an excerpt from an interview set to be broadcast on Hungarian news channel Hir TV next week. According to Semjen, France's "secularist, anti-church policy is also deeply responsible" for Monday's fire. "May God allow this tragedy to be a sign which shakes up the French nation, not just regarding the reconstruction of the church but also in terms of their own national self-esteem, their own history, their own Frenchness and their own Christianity," the politician, who is also the head of Hungary's Christian Democratic Party, said. Semjen noted that Budapest would consider helping to fund the effort to rebuild the Notre Dame, but added that France is a "rich country" and President Emmanuel Macron should have announced Paris'commitment to rebuilding the iconic cathedral. Macron described the cathedral fire as a "terrible tragedy" and vowed to restore the Notre Dame within five years. The Notre Dame, an irreplaceable example of ancient French Gothic architecture, went up in flames on Monday evening, and burned into the early hours of Tuesday morning as firefighters struggled to douse the flames. The cathedral was built between the 12th and 14th centuries, and was the site of royal marriages, coronations and farewell ceremonies for prominent French officials over many centuries, becoming one of the most prominent landmarks of the French capital. The church was undergoing restoration work when Monday's fire broke out. Authorities are treating the blaze as an accident. Officials from Hungary and France have clashed repeatedly on the issue of European identity and the alleged threat immigration poses to the continent's 'Christian heritage'. Earlier this year, Hungarian Prime Minister Viktor Orban called President Macron "the leader of the pro-immigration forces" and vowed to "fight him." Hungary and several other nations in Central and Eastern Europe rejected the EU's proposed migrant quotas, leading to criticism and threats of sanctions from Brussels, Paris and Berlin.